The presence of a villainous sorcerer is fundamental to a good Swords and Sorcery tale. While the setting of Life and Death, the post-magical apocalypse setting of The Shattered Lands, is very low magic in keeping with genre expectations, the bad, mad and downright dangerous to know are out in force as antagonists in the books collection of adventures. Bilgen, is very much your young unpleasant black magician in training. He’s very much modelled after obnoxious wanna be sorcerers I met in my real life student days. Petty smelly types who call other people “norms” or “mundanes” taking great pride in their knowledge of Magick without ever really doing much. Bilgen has a handful of spells that make him useful to the bandit chief, who also is deluded and thinks he’s a powerful Merchant Lord, and allows him to terrorise the local peasants. Tel-Kar-Nath is the real deal. He is a sorcerer who is fit to be the player character’s nemesis and is a worthy adversary. He’s been a powerful court magician in a previous life whose machinations brought down reality, been imprisoned in hell for his crimes and is now back a monstrous thing with a psychotic personality. If they attack him, he uses his magic to evade and escape and his zombie followers to hold them off. He is more interested in playing the role of the enigmatic magical master than dealing with the characters, whom he believes are beneath him. The King in Chains was once a sorcerer of immense reality blasting potential like Tel-Kar-Nath, but is now a husk of his former power. He has been brought back into being as an undead creature, by a ruthless Necromancer who uses him as a magical power source and channel for raising more Zombies. Even in this half-dead state there’s something that realises that this isn’t a good state of affairs and who knows what vengeance it will wreck if the player characters ever loosen those chains. 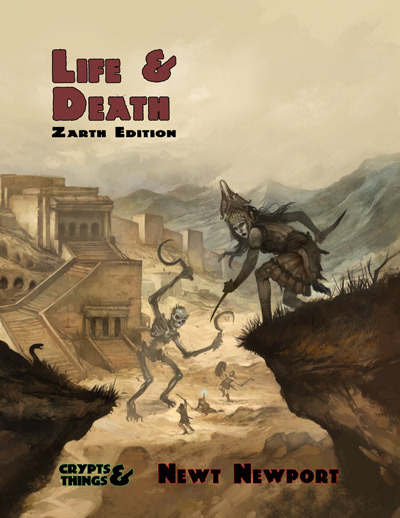 Life and Death is a collection of four adventures that make up a mini-epic tale of a struggle against the forces of Undeath in a world recovering from a magical apocalypse. 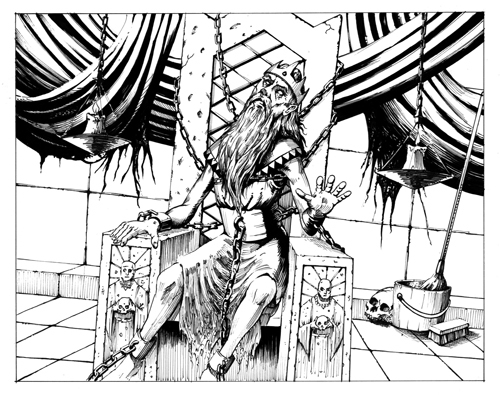 It is a conversion of an existing OpenQuest adventure, for Crypts and Things and other Class/Level based Fantasy RPGs with all new art by David M.Wright (the artist who illustrated Crypts and Things in its entirety. Its currently been worked on for a release later this month. Life and Death – Zombies. Sounds awesome, I’m buying Open Quest edition soon. One thing to be aware of the OpenQuest edition art is by a different artist.